I was struggling to put together a nature/science block for December all last month. I deliberated. I read. I had ideas. I lost ideas. Yet, I don’t like to engage in intellectual, abstract studies with them and all too many of my ideas seemed to rely on ME telling them something. However, their curiosity in the natural world beckoned some anchors. After all my great reading and engaging ideas, many of them were just too ambitious and not authentic to what I’m striving for in these early years. Then it dawned on me. Why not just take them to various ecosystems during a week-long period (as to provide that contrast in a short time period) as their nature block?! Mondays we typically do a morning lesson and a handwork project. I had an idea that for handwork we could make ecosystem journals to use hiking for the week. The notebooks would provide them with those “anchors” the various parts of an ecosystem and a place to sketch and doodle as they pleased. 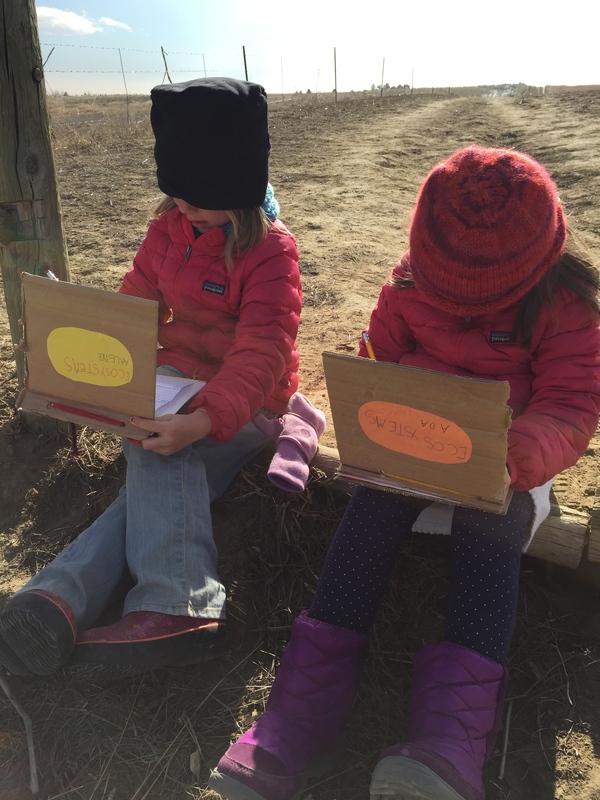 Journals were a success and so was our first ecosystem exploration– grasslands. Within a couple miles of driving east, it is clear you’re in a different landscape. Suddenly the foothills and mountains are replaced with gentle rolling hills, flat wide expanses of land, large deciduous trees, ditches and creeks . The grassland area we hiked was nestled between some homes and farms- many parts of the area restricted in an effort to protect burrowing raptors as well as other birds of prey. The American Bald Eagle apparently likes to hunt in this area and according to one of my books, we were sure to spot some overhead or atop a tree. Hawks too are numerous in the area and indeed, we saw both and more. I was amazed that after so little conversation about the parts of an ecosystem that they could put together the concept behind an ecosystem. Saying things like, the hawks are here because the prairie dogs are and they want to hunt them. These grasses must like the dirt here because we don’t see them anywhere else. Fun stuff. We hiked along the trail which was easy with some gentle slopping. We walked through and by various grasses, yuccas, and spent summer flowers such as sunflowers. We saw many prairie dogs, a Western Kingbird and a few other songbirds. It wasn’t until we sat down along the trail for lunch that we spotted the hawks and then eagles soaring overhead, looking for an opportunity. The rather talkative, barky prairie dogs instantly quieted and froze. The girls were totally impressed with their ability to freeze like that! It was amazing after all that activity and barking that they could hold still and camouflage in so well! The predators circled overhead for some time– the bald eagles in a pair with immense their wingspans and beautiful glide. We spotted the hawk, lighter in color and slightly smaller later as we hiked back out. It was a pretty cold day, but when the sunshine came out from behind the clouds, we all relaxed into it. We even talked about how this would be a difficult place for animals in the summer since there were so few places to seek cover. Old cottonwoods grew in and along the ditches along the trails and they both suggested that was probably where water collected. It was a sweet time with amazing connections, hand holding and happiness.